These next 6 blog posts will cover 6 simple steps to approach a design like a pro. The best way to take any challenge on, is to break it into bite size pieces. So lets do just that. When you are looking to start a project and you’re not sure where to begin, start with a little inspiration from your favourite magazines, blogs and decorating shows. These are always great places to go to get the creativity flowing, but don’t stop there, inspiration can come from anywhere. It could be the colour of a handbag in a shop window or an old art piece you picked up at a garage sale. I’ve found inspiration in the smallest of things, like owl shaped coat hooks or tiny coloured spice jars. You never know what’s going to end up as a starting point for a great design, so be open to finding inspiration anywhere. Another great idea would be to browse the Olioboard library for up to date products from your favourite stores as well as browse through our members Olioboards. If you’re looking for inspiration on any style or colour palette, you will find it there. To make collecting items an easy and fun process, try out our browser uploader. You can use it to upload items from anywhere online to your Olioboard account. It’s a simple two click process and you’re ready to go. When you see something you like, take a picture or save it and upload it to Olioboard. Don’t worry about whether or not it works with the other items. The point of this exercise is to gather things you like, be it modern, traditional, hot pink or pastel blue. Collect anything that grabs your attention. You can always weed items out later. 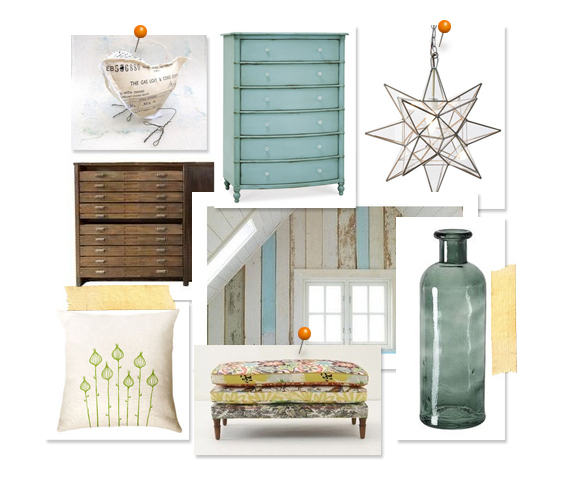 Once you have a good collection of items, create a number of olioboards by grouping like minded pieces from your collection together. I sometimes like to create one olioboard with multiple design ideas within it. It helps me quickly determine which direction I like the most. 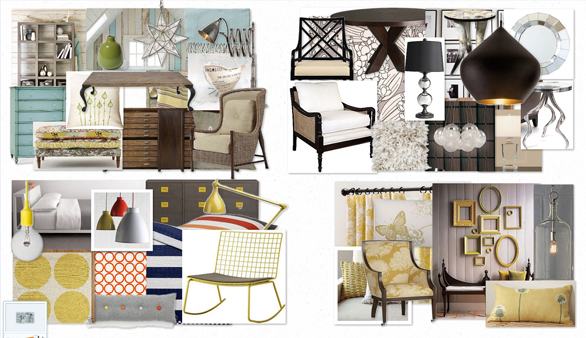 Have a good look at your olioboards and see if any patterns arise from your collection. Maybe you’re really drawn to the colour royal blue or items that are from the mid century. Do many of your items have a clean line and simple approach to them or are they a touch more ornate? By really diving into your selections, you will start to see themes building from what you have gathered. This is the first step in determining what your style really is and when you know that, the rest becomes much easier.